One's heart really had to go out to Kingston Cataraqui Clippers' keeper Navi Sidhu, who had a truly impossible job on his hands Saturday afternoon in Toronto. The poor man had to line up against Toronto FC Academy superstar striker Molham Babouli, who came into the game with a league-high twenty-one goals, and was primed to fill the net at Kia Training Ground. And Babouli, along with the rest of his mates, was in fine form, finding the “old onion bag” four times in just over an hour to lead the way in an 11-0 thrashing of Kingston during the final match of L1 Cup Group A play. It left TFC Academy in first place in the four-team group, and moving on in the playoffs, with Kingston finishing in third and out of the competition. Durham United FC finished in second spot, while ANB Futbol were last in the group. Toronto FC Academy ran riot on a warm afternoon, as Kingston brought a single sub on the long bus ride down the 401, and soon had to use him when a defender was felled with a head injury. While it was 1-0 for a while early on, the goals started to come in bunches. Babouli had his four by halftime and was joined by goals by Marcos Andres Nunes, who wound up with a hat-trick on the game, Anthony Osorio (younger brother of TFC’s Jonathon Osorio) and Luca Uccello, to make it 7-0 at the break. 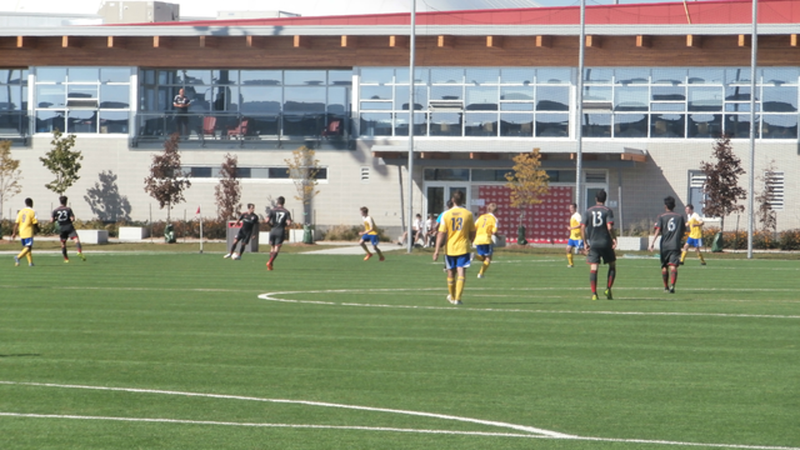 A number of TFC Academy subs came on for the second half, but the goals kept coming – four for the second half in all. At the end, the tally read: Babouli four (of twenty-five on the season); Nunes three (of ten on the season, and a share of second spot in the scoring charts with Vaughan’s Andrew Ornoch; two for Osorio; and one each for Luca Uccello, who has seven on the season, and Marco Rodriguez. Despite the lopsided scoreline, TFC Academy head coach Michael Stefano insists his young side did not try to run up the score. For Nunes, the game was a chance to show his style and finishing ability, often overshadowed on a team where Babouli regularly steals the show. “The team is what matters. I’m performing because of the team. Everybody else is doing a great job. I couldn’t score without my teammates, my teammates are what help me,” said the twenty-two year-old, who is in his first year with TFC Academy. TFC now waits to see how the Group B side of the Cup draw turns out. There are still two games to play, both involving Vaughan Azzurri, which has a pair of home matches remaining – a makeup game against Masters, and a contest with Windsor. The top two teams in Group B will move on with TFC Academy and Durham United to contest the L1 Cup. Sigma are the current leaders in Group B with seven points; Woodbridge sit in second with six points; Vaughan are third with four points; Masters are fourth with four points; and Windsor, the only team eliminated in the group, are last with just one point and only one game to play.